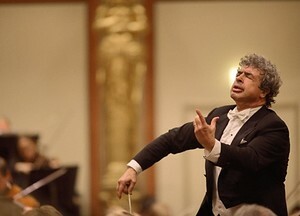 Semyon Bychkov conducts at the Wiener Musikverein. NEW YORK, NEW YORK (March 19, 2019) — After more than 20 performances with the New York Philharmonic over the past three seasons, Semyon Bychkov returns to lead the orchestra in two programs over two weeks in April and May. Among the works to be conducted by Mr. Bychkov is the U.S. premiere of a symphony dedicated to him, Thomas Larcher’s Symphony No. 2 (“Kenotaph”). This work, which was given its world premiere by Mr. Bychkov and the Vienna Philharmonic in 2016, is paired on the first program with Brahms’s Symphony No. 4, a piece in Mr. Bychkov’s core orchestral repertoire. Performances take place at David Geffen Hall on Wednesday, April 24, 2019, at 7:30 p.m.; Thursday, April 25 at 7:30 p.m.; Saturday, April 27 at 8:00 p.m.; and Tuesday, April 30 at 7:30 p.m. Mr. Bychkov also conducts the Brahms symphony at Geffen Hall on Saturday, April 27 at 2:00 p.m. as part of the orchestra’s Matinee Series. The work is preceded that afternoon by Brahms’s String Quartet No. 2, performed by Philharmonic musicians. Recognized as a leading interpreter of Strauss, Mr. Bychkov conducts Ein Heldenlebenon the second program, which also includes Martinů’s Concerto for Two Pianos, featuring Katia and Marielle Labèque. Performances take place at David Geffen Hall on Thursday, May 2 at 7:30 p.m.; Friday, May 3 at 2:00 p.m.; and Saturday, May 4 at 8:00 p.m.
Tickets starting at $33 (April 24–25, 27 evening, and 30), $35 (April 27 matinee), and $31 (May 2–4) may be purchased online at nyphil.org, by calling (212) 875-5656, or at the David Geffen Hall Box Office. Mr. Bychkov subsequently conducted Symphony No. 2 with the Munich Philharmonic. The symphony’s subtitle, “Kenotaph,” refers to monuments erected to commemorate those killed in war, or in the composer’s own words, “graves for lost and forgotten souls.” The work was written in reaction to the European immigrant crisis and in sympathy with its victims. In 2018, Symphony No. 2 won for its composer the Fondation Prince Pierre de Monaco's Musical Composition Prize, which is given every three years and awards €75,000 as well as the commission of an original composition. Previous recipients of the award include George Benjamin, Pierre Boulez, Elliott Carter, George Crumb, Péter Eötvös, Sofia Gubaidulina, György Kurtág, György Ligeti, and Michael Tippett. Brahms’s Symphony No. 4 and Strauss’s Ein Heldenleben are both important works in Mr. Bychkov’s core orchestral repertoire. Last year at the New York Philharmonic, he conducted Strauss’s Eine Alpensinfonie, which he previously recorded with the WDR Symphony Orchestra Cologne. With WDR, he also recorded the complete Brahms symphonies. These performances will mark Mr. Bychkov’s fourth consecutive season conducting the New York Philharmonic. In 2015–16, he led performances of two programs featuring works by Brahms, Mahler, and contemporary German composer Detlev Glanert; in 2016–17, he curated and conducted the Philharmonic Festival Beloved Friend: Tchaikovsky and His World, part of his larger, international Tchaikovsky project that he continues with the Czech Philharmonic in a recording cycle of the composer’s complete symphonies and piano concertos, among other orchestral works; and in 2018–19, he conducted two programs featuring works by Berio, Shostakovich, and Strauss. Following his two weeks in New York, Mr. Bychkov conducts the Cleveland Orchestra in a program that includes the U.S. premiere of Detlev Glanert’s Weites Land: Musik mit Brahms. He then returns to Europe for performances with the Munich Philharmonic and Royal Concertgebouw Orchestra. His summer engagements include concerts at the BBC Proms and Edinburgh Festival, as well as Parsifal at the Bayreuth Festival. For more information, visit semyonbychkov.com.